I am involved in a Socrates: Grundtvig 2 -project called THE ROLE OF ARTISTS IN LEARNING COMMUNITIES (2005-2008) as a co-ordinator. We will have three different international communal art workshops. 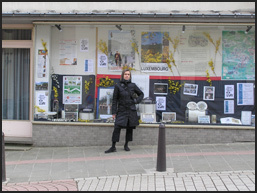 The first one was 2006 in a small village called Wiltz, Luxembourg. Next one will be 14-28th of April 2007 in Dublin and the last one in rural areas near Turku & Nykarleby, Finland 2008. We will conduct a research project along the three workshops and planning to make a publication after the third workshop. 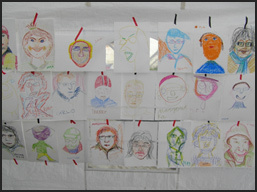 The learners are diverse (some are professional artists and some disabled artist workers from Co-operation/Luxembourg) as well as the communities we work with. The partners in this project are Cooperations asbl / Wiltz / Luxembourg, The National College of Art & Design / Dublin / Ireland, Svenska Yrkeshögskola / Nykarleby / Finland and Turku University of Applied Sciences / Turku / Finland. THE ROLE OF ARTISTS IN LEARNING COMMUNITIES has been personally important for me in many different reasons. It has able me to build a long term critical international network, I have now first hand experience in different aspects of communal art, the possibility to develop models of best practice with my partners, I am able to conduct research along the project and have the opportunity to have different roles during the project besides being the co-ordinator, for example in Dublin I will document the different communal art projects and do some research. As part of my work I also plan and conduct extra studies (one or two year studies) for professional artists at Turku Arts Academy. Just now we have two years education (2006-2007) about socially engaged public art/communal art, 60 ECTS. It consists of theoretical and practical studies. There are eight artists in the group and they will also take part of the Grundtvig 2-project, Luxembourg & Dublin. We are planning to organize a same kind of extra studies, 2008-2009, with a wider interdisplinary group. Inside the department of fine arts we are interested in conducting and developing models of best practice in the field of public/communal art for BA-students. I feel that in socially engaged art practices questions of ethics as well as aesthetics are areas to develop, especially for our BA-students. We are, for example, starting systematic documentation and interviews in these kinds of art practices in order to develop critical thinking, course contents, counseling etc. As a theoretical challenge in Working In Public: Art, Practice and Policy I would like to explore more the roles of artists (also the ethical ones), with dialogical contemporary art research methods, in collaboration with artists. I am also interested in diverse possibilities of creative field work documentation & autoetnographic research practices. Practices combining private & public, personal & theoretical, subject & object etc. in ethical and political ways.